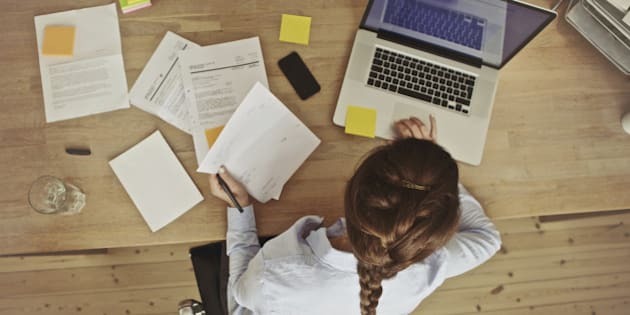 In celebration of Small Business Month, here are eight tips from Professional Organizers in Canada on how to keep your small office or home office organized and efficient. - Implement a few ideas that make sense to you and the way you like to work, you'll be much more likely to use them if you're not forcing yourself to use an uncomfortable process. - If you like things visible, use products to make them accessible while keeping them neat, such as a vertical sorter for files you want handy. You know your style better than anyone -- don't get pushed into an alphabetical supply cupboard for a staff that functions best with visual cues. - Use the language you would normally use, with familiar names -- keep it simple. - Store paper materials, electronic files and emails using your tailor-made filing hierarchy and you'll find things where you expect them to be. The simpler the system, the quicker and less taxing it is to use. Give your brain a break -- don't store information with one system for paper, another for electronic and yet another for emails -- constantly using the search function wastes your day, 30 seconds at a time. - As you corral your materials in binders, bins or baskets be sure to buy them in your company colours. - Display your media coverage, testimonials and products attractively. We may not consciously recognize it, but this sends a very powerful message and it's a great way to take advantage of those marketing dollars you spend branding your businesses -- it's simple and inexpensive. - Does it reflect the image you want to project to clients, colleagues and employees? - Does it stimulate your creativity, motivate you and provide a haven where you can settle in comfortably to do your best work? Taking a fresh look at your office with new eyes could be a catalyst for positive change. - Ask your lawyer and accountant for a list of the documents you are legally obligated to keep. - Have a clear retention policy so you can edit with confidence. Avoid a build-up of obsolete documents because everyone is afraid to throw anything out -- set a clear policy for what needs to be kept, and what can be safely discarded. - Does the glare on your computer screen make you reach for your sunglasses to type an email? - Do you go to meetings without your marketing materials because they're in a cupboard behind that mountain of boxes that got dumped months ago? Doing a simple analysis of how your office functions physically could save you thousands of dollars in time, supplies and equipment. - Is there a logical flow (think of an assembly line) of work through the office? - Do you have a place to work comfortably and efficiently on your projects, or are you cramped into a corner of your space? Take a tip from Feng Shui practice -- have your work environment reflect respect for you and your work. - Is there a line-up to use a piece of equipment? - Does the workspace provide physical safety and an atmosphere conducive to concentration? We can learn from the principles of lean manufacturing and encourage input from front-line workers to improve productivity and eliminate the waste of time and resources. For more information on Professional Organizers in Canada or to find a professional organizer in your area, visit the POC website. Calm, clean spaces let the creativity flow. And lush, cozy touches put the mind at ease. Even the trickiest spaces can become the chicest of offices. Condo Remodel by Wentworth, Inc.
A larger-than-life mural is the perfect stand-in for a great view. Softly draped windows create a quiet place to think. And a pop of art is the perfect piece of inspiration. ...though other times it's all about the bold accents and bright hues. Los Altos Residence by Miller Design Co.